We meet on the first Thursday of the month from September to June. We are holding our meetings at the Radnor Memorial Library. the meet and greet will start at 6:15 and the program promptly at 6:45. All our regular monthly meetings are shown in red, and meet on Thursday evenings at 6:15 in the Winsor Room at the Radnow Memorial Library (unless otherwise noted in the write-up). Activities shown in green are Community outreach projects. Their times and locations are shown in the description. Blue denotes additional activities for pleasure. The club will plant a tree to honor any members who recently passed away. A covered dish luncheon will be provided by members. Coordinated by Toni DeGeorge and Robin Gregory with Dr. Harold Sweetman, Executive Director, Jenkins Arboretum. Bring gloves, trowels, and your garden treasures to prepare for the Annual Plant sale. Nichole will hightlight inspiring local examples that show how horticulture can be successfully used as a tool for community development, improving neighborhoods, providing educational opportunities, promoting the health and well-being of citizens, and addressing food insecurity. 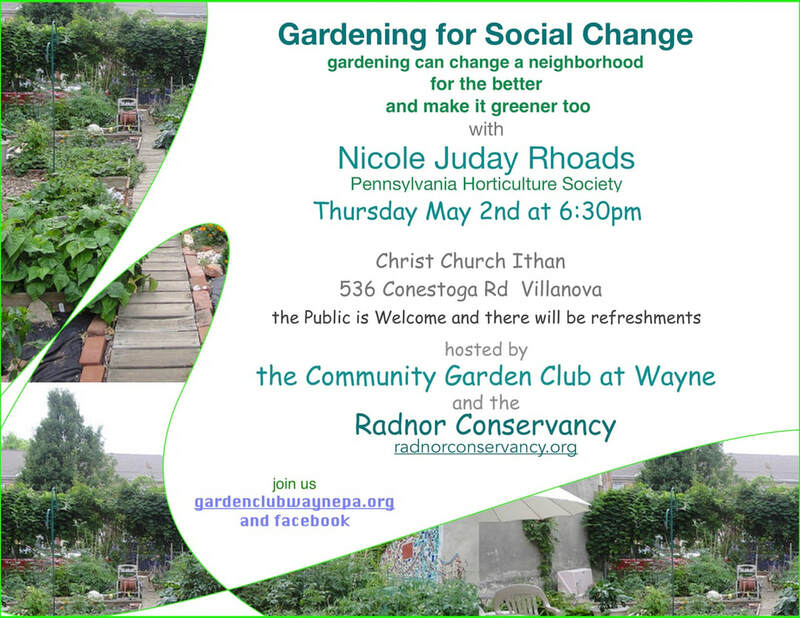 This event is co-sponcered with The Radnor Conservancy. The Plant and Bake Sale supports our many community services. We'll have annuals and perennials for sun and shade, herbs, tomatoes, beautiful hanging baskets, a special pot 'em up activity for children for Mother's Day, and our wonderful collection of garden teasures, great plants, well adapted to this area, from members' gardens. Enjoy delicious baked goods prepared by members. Preparation for the Plant Sale begins in April as we get pre-orders for our friends and ourselves. Then on Friday May 10 in the late afternoon, we'll need help getting everything set up for the big day. Finally the fun part comes. Working at the sale is a great chance to spend some time with friends as we share our gardening expertise with the public at the sale itself. Watch for a chance to sign up for slots to help out at the plant and bake sale. Plants from the plant sale will be donated to Project Home.